US forces say they have made a major advance into a mainly Shia area in Baghdad that is a stronghold of the radical Iraqi cleric Moqtada Sadr. Residents of Sadr City told the BBC there was fierce fighting overnight between the Americans and Shia militia. And in Najaf, where Mr Sadr's armed supporters are locked in a stand-off with US and Iraqi troops, gunfire reverberated on Thursday. A police station was also hit by mortar fire killing up to six people. The station was not close to the Imam Ali shrine Mr Sadr and his supporters are occupying. The cleric has offered to end the uprising if there is a truce. But Iraq's government says he is an "outlaw" and has given the cleric and his Mehdi Army militiamen "only hours" to leave the Imam Ali shrine, or face military action. An explosion hit the Green Zone in Baghdad on Thursday as the US military operation in Sadr City was "ongoing". It was not clear what had caused the blast in the heavily-fortified area where the Iraqi government and the US embassy are based. The BBC's Matthew Price, reporting from the outskirts of Sadr City, says the Americans appear to have moved right into the heart of the district in great numbers. He saw two disabled US tanks which he said had probably been hit by rocket-propelled grenades, and he could also see more tanks deployed along one of the main roads. The situation was calm, he reports, although residents contacted by the BBC said they were stuck in their houses, unsure whether it was safe to come out. An American soldier was killed in the fighting, a military statement reported by French news agency AFP said. Another US soldier was wounded during the assault on the suburb, which is home to about two million people. In an echo of a similar warning on Wednesday, an Iraqi minister said Mr Sadr had to renounce violence, disarm and leave the holy sites in Najaf or face military action within hours. "We have been preparing for a military offensive for five days to put an end to this crisis," cabinet minister Kasim Daoud told a news conference in Najaf. The government's ultimatum came despite a written offer by Mr Sadr, delivered to Iraq's national conference, to withdraw from the Imam Ali shrine if the American and Iraqi forces besieging him agreed to a truce first. One of the organisers of the conference read out a letter in which the cleric accepted the national conference's terms. These also included joining the political process in exchange for an amnesty, she said. A spokesman for Mr Sadr, Sheikh Ahmed al-Sheibani, told Reuters news agency that he wanted the government to send a negotiator to work out details for ending the crisis. Another of his spokesmen, Sheikh Hassan al-Zerkani, told the BBC that the cleric's offer was genuine, but guarantees needed to come from the occupiers, not the occupied. He said signs were needed from the Americans that they would not go after the Mehdi Army. 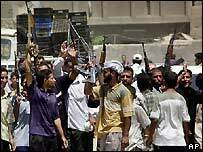 The Iraqi defence ministry later said Mr Sadr and his followers would be granted amnesty only after they abandoned their uprising in Najaf and other cities. 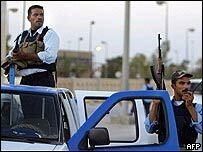 The BBC's Kylie Morris in Najaf says Mr Sadr has shown himself a master of brinkmanship and bluff in the past - and whether he is sincere in his offer will only be clear when peace returns to Najaf. "The Americans and the Iraqi government are running out of patience"